This map is based on the International Monetary Fund data for 2013. 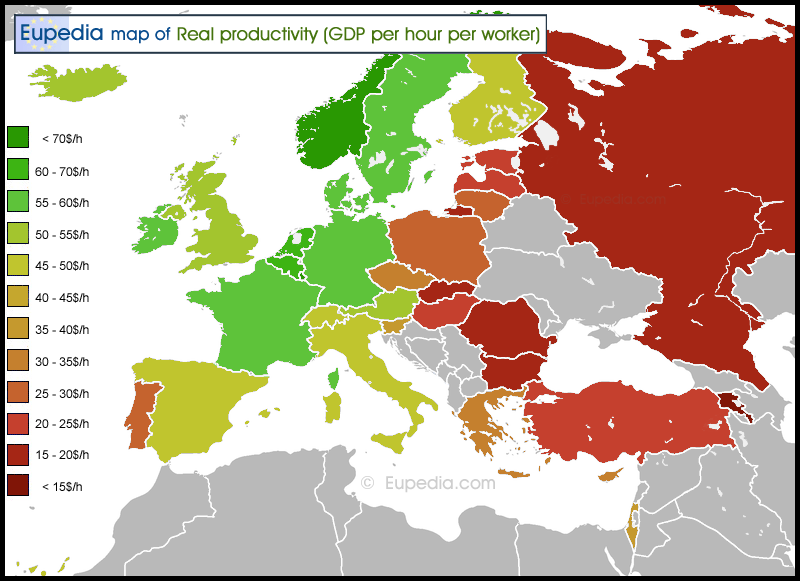 This map is based on a Labour Productivity report by The Conference Board for 2013. 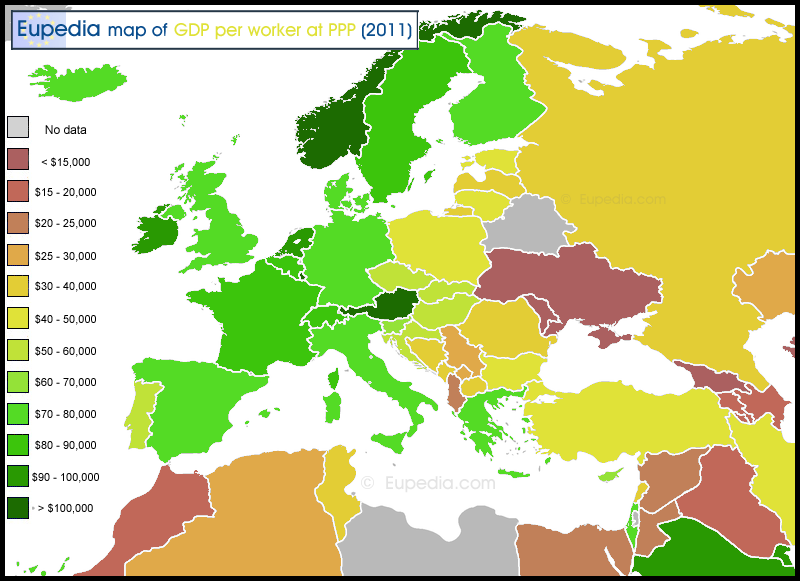 This map is based on the GDP (PPP) per person employed from the CIA's World Factbook for 2011 (data for Bosnia, Serbia and Albania is from the World Bank for 2010). 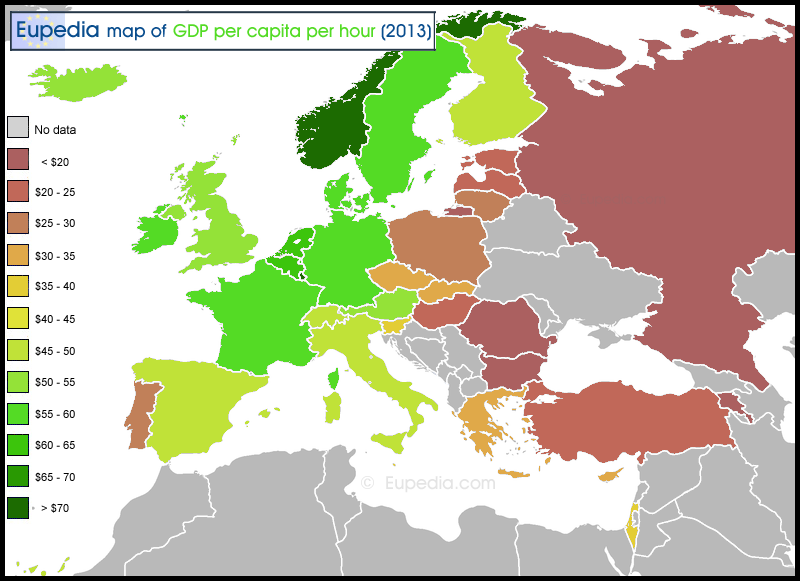 This map is based on the GDP per capita (PPP) per hour per worker for 2013. 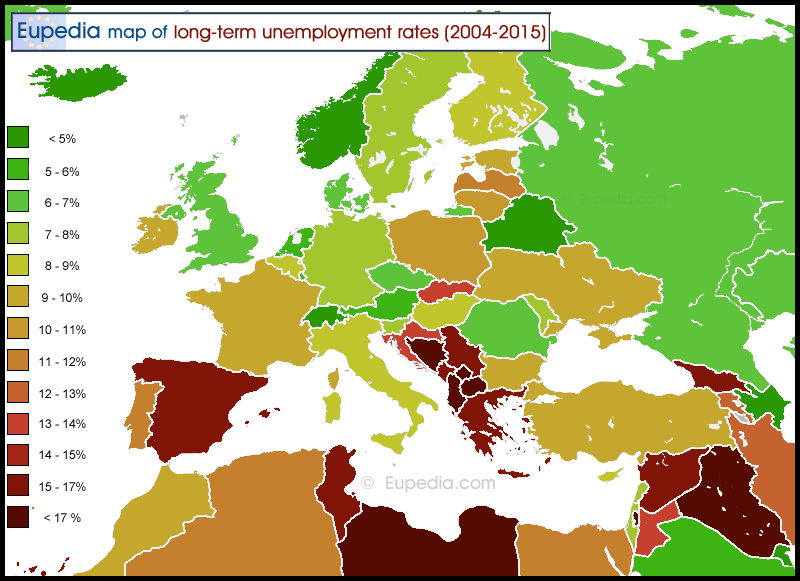 This map is based on the unemployment rate data for the period 2004-2015. 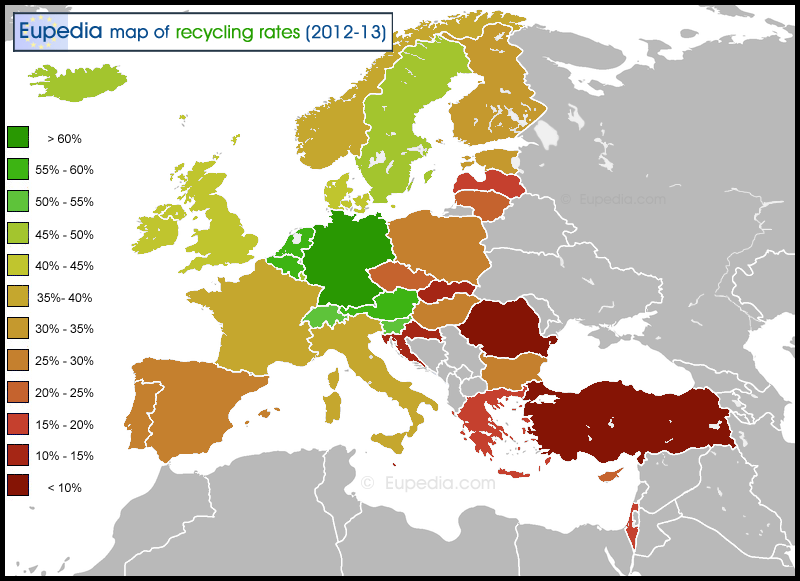 Data for EU countries was obtained from Eurostat. Data for other countries came from Trading Economics. This map is based on the OECD Better Life Index for 2016. Net financial wealth consists of : currency and deposits, securities other than share, loans, shares and other equity (including shares issued by investment funds), insurance technical reserves, and other accounts receivable or payable, net of household financial liabilities, as defined by the System of National Accounts – SNA. It does not include properties, pensions and life insurance. This map is based on the OECD Better Life Index for 2016. 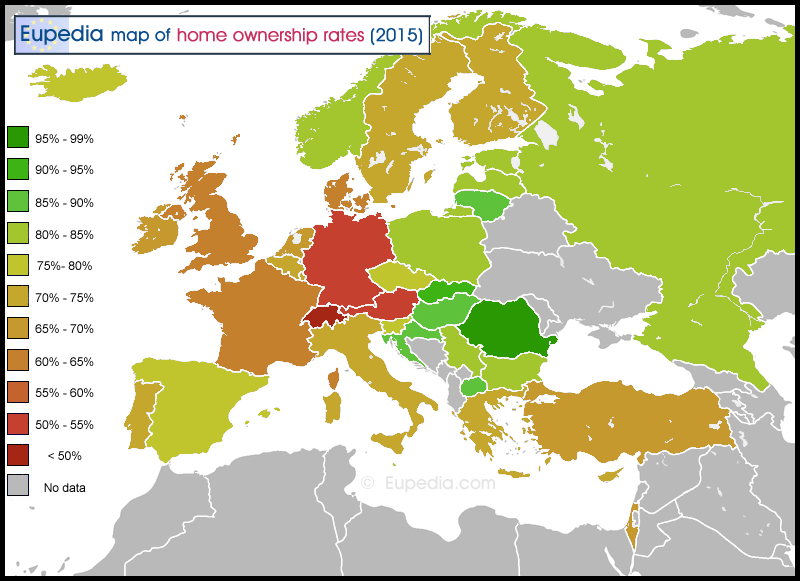 This map is based on the Eurostat for 2015. 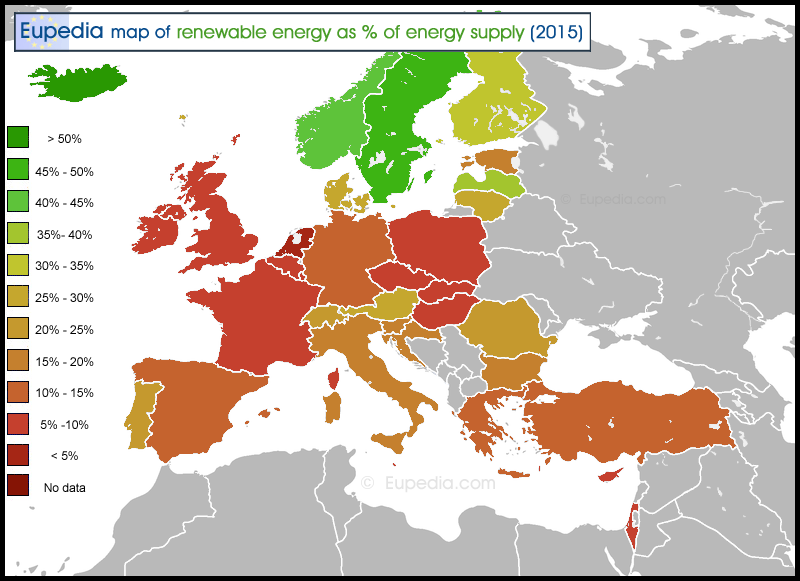 Additional regional data was used for Germany and Italy. The household income differs from the personal income or income by employee as it takes into account the number of people in the household (larger families have a lower household income) and the number of people working in the household. Countries with a higher percentage of women working and a lower gender gap for salaries (like Scandinavian countries) score higher household incomes. To calculate equivalised income, membres of the household receive different weightings. Total household income is then divided by the sum of the weightings to yield a representative income. 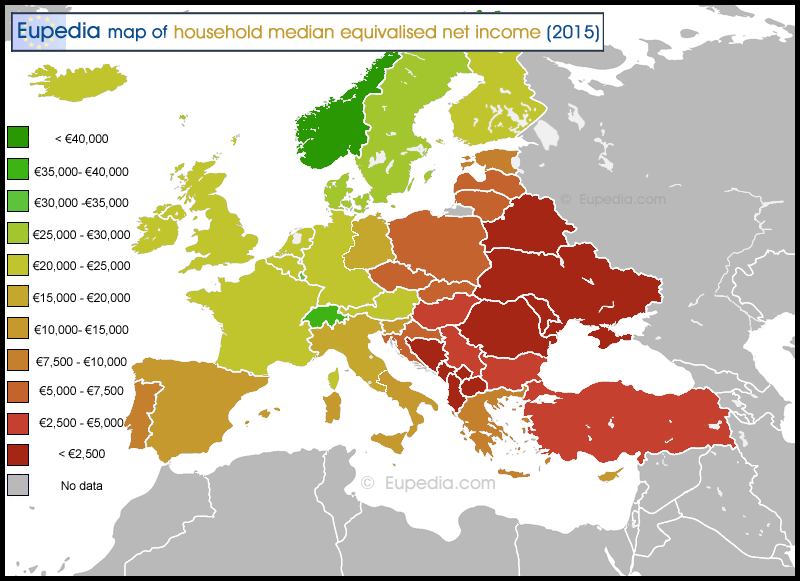 The household median equivalised net income represents the disposable income after tax of a family right in the middle section of the population (half of the population being richer, the other half poorer). In other words, it could be seen as a representation of the most average middle class family. 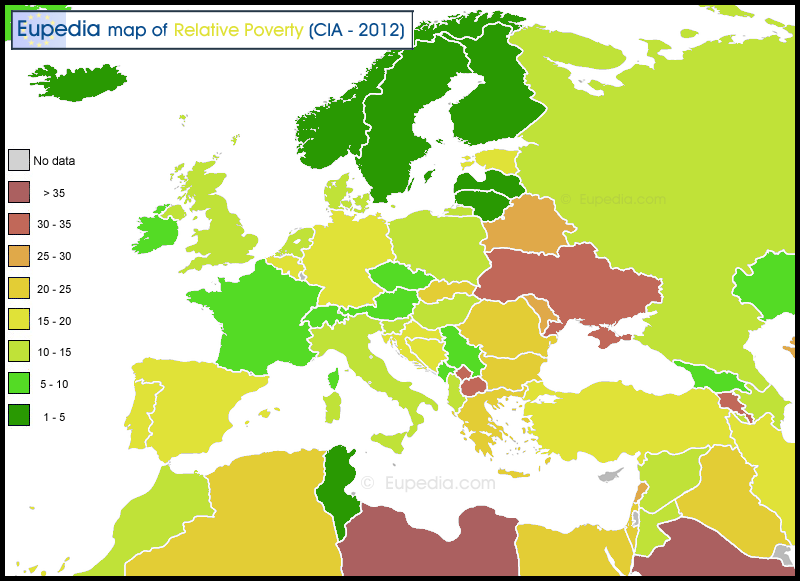 This map is based on percentage of the population living below national poverty line. The data is from the CIA World Factbook for 2012, except data for Iceland, Sweden, Finland, Italy, Libya and Saudi Arabia, which was extrapolated. 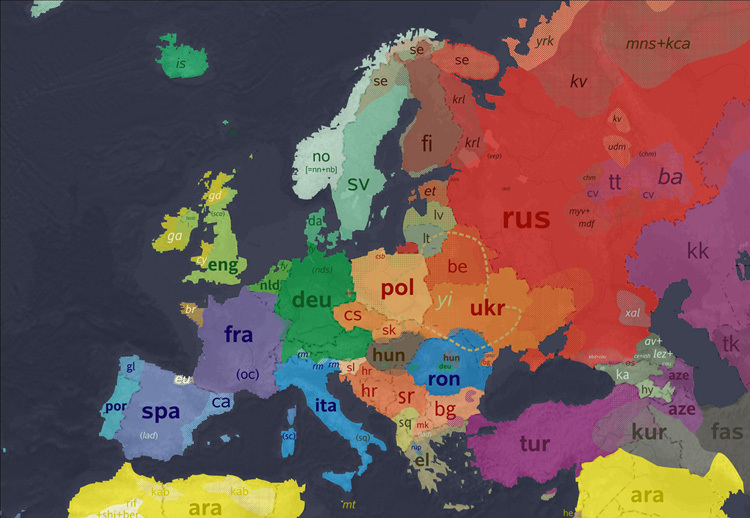 This map is based on the various sources listed on Wikipedia but mostly from Eurostat data for 2015. 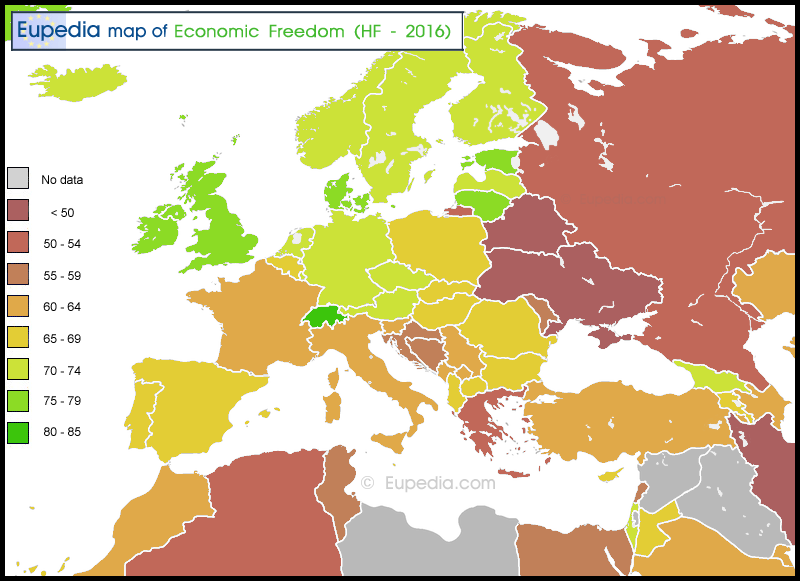 This map is based on the Index of Economic Freedom (2016) created by The Heritage Foundation and The Wall Street Journal. 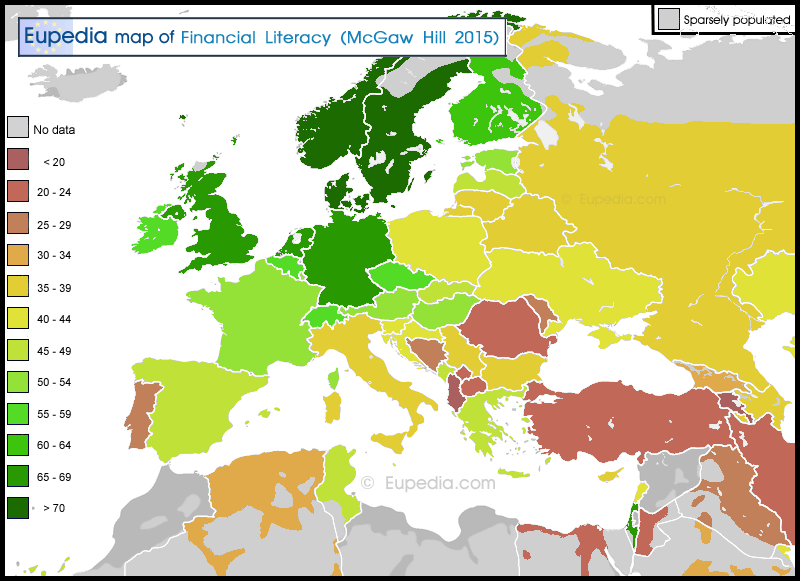 This map is based on average scores by country on the Standard & Poor’s Ratings Services Global Financial Literacy Survey. 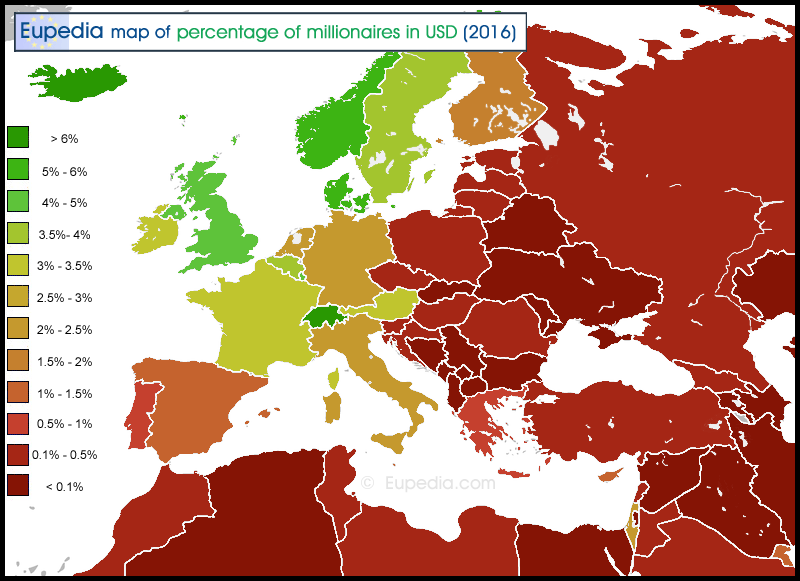 This map is based on Credi Suisse's Global Wealth Report for 2016. This map is based on the International Telecommunications Union (Geneva) data for 2012. 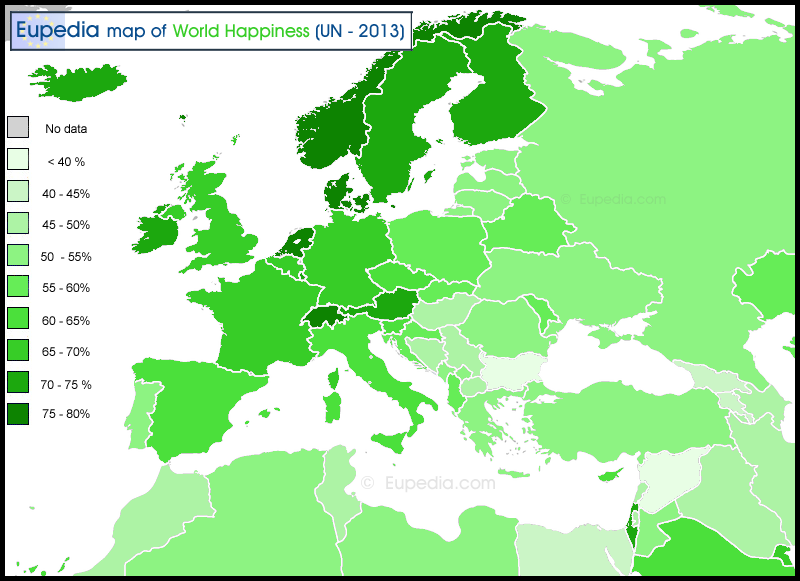 This map is based on the Gallup Well-Being Index (mid-2013 data). The map shows the percentage of people thriving (scoring 7/10 or higher on the well-being scale). 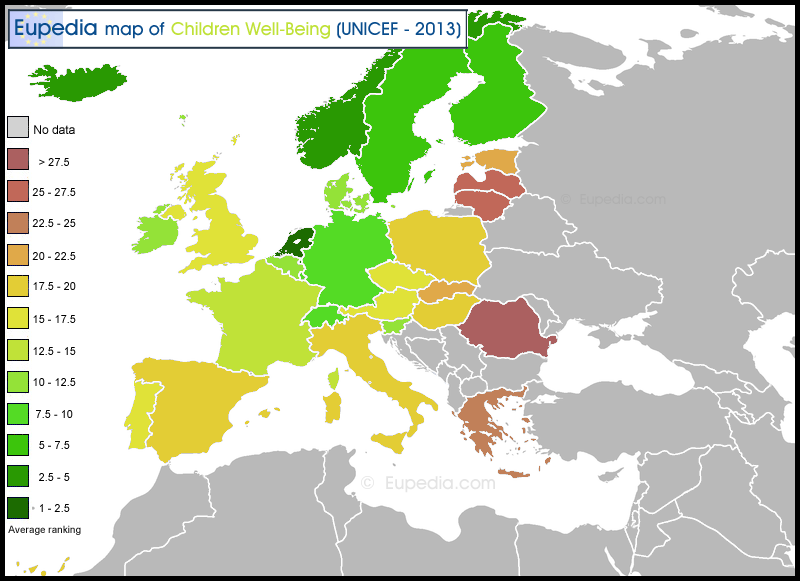 This map is based on a UNICEF report on children well-being in 29 countries for 2013. See also 2006 report. This map was made by averaging the data from the Eurostat (2012) and the OECD (2013). This map is based on the data from OECD for 2015. Data for non-OECD countries is from the EU. The content of this page is purely indicative and subject to changes, approximations or errors.